to the exact location easily and efficiently? a ball is thrown on the field while coaching next to your player? by using a wireless controller to command the placement of each ball remotely? placing balls exactly where you wanted them automatically at the time you set? on misplayed balls from last night’s game and practice them until you got them right? and fielding with one efficient portable machine? with pitches thrown every three seconds? 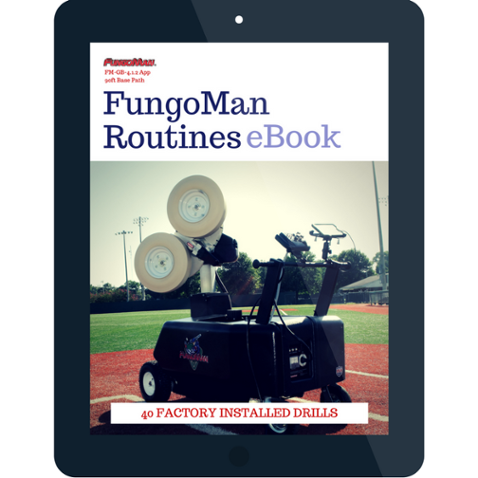 FungoMan® produces and sells the most efficient, portable, and advanced baseball and softball practice repetition machines available. For more than 14 years, engineers and programmers at FungoMan® have researched and developed the hardware and software needed to revolutionize practice made perfect. Leading-edge technology has been introduced to control the motion and speed of the throwing head. A revolutionary and patented ball-feeding system ensures perfectly placed balls that can fire every three seconds with speeds over 100 mph, allowing players and coaches to run basic to advanced pre-scripted pitching or fielding drills. Visionary coaches and players have used the FungoMan® technology and implemented it into their practices. As a result of the efficiency in delivering fundamental repetitions, time to explore advanced techniques and training methods are now common place on fields across America and abroad. This phenomenon has translated into player and team success stories and championships. Customer satisfaction is #1 with FungoMan®. A bumper-to-bumper 1-year warranty, on staff engineers, programmers, and customer support staff ensures user confidence. FungoMan’s satisfied list of customers range from individual professional and amateur players to MLB, Collegiate, High School, Academy, and Youth League Teams. These corporate values have built a reputation for exceptionally flexible, effective, and innovative products for players and coaches at all levels desiring to improve and perfect their individual and team skills. Explore and learn how the FungoMan® technology is transforming players and teams. Comprehensive U.S. and foreign patents that claim the basic device, method and system for operating FungoMan®, including the software and custom programming have been issued. The driving force at FungoMan® is meticulous attention to product innovation based on modern coaching needs. You teach by repetition. FungoMan is the best piece of equipment that allows me to partner with my players by being next to them and really coach.